Michele Molinario | Jones, Skelton & Hochuli, P.L.C. 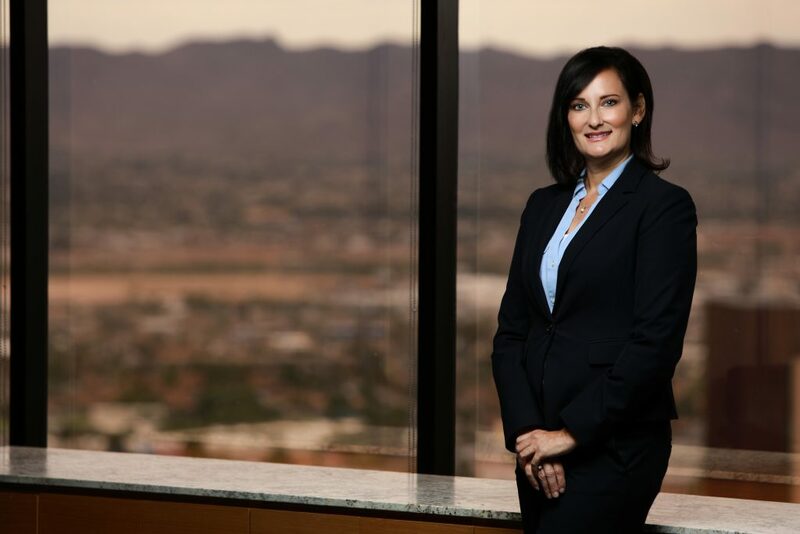 An experienced trial attorney, Michele Molinario has dedicated her professional career to defending correctional institutions, and public entities and their employees, including police officers, detention officers, emergency responders, public works directors, and traffic engineers, etc. Her 14 years of experience working as a civilian at the Tempe Police Department in the Narcotics and Special Enforcement Unit has afforded her an insider’s perspective with the various training exercises related to non-lethal and lethal force incidents, hostage negotiations, K9 deployment, and tactical breaching methods, etc. Michele is committed to defending law enforcement agencies and officers throughout Arizona. She has prevailed on summary judgment in cases involving the Notice of Claim statute, excessive force, false arrest, illegal search and seizure, malicious prosecution, defamation, and negligent hiring. Michele provides correctional defense across the various Arizona Jails. Michele has prevailed on summary judgment in cases involving allegations of excessive force, unlawful prison conditions, due process violations, and First Amendment violations. Michele has defended public entities and private prisons in Section 1983 claims that include police-related non-lethal and lethal force incidents, SWAT raid/breaching tactics, failure to protect incidents, failure to render medical care, and various search and seizure incidents. Michele maintains an active employment law practice and has prevailed on summary judgment in cases involving Title VII, FMLA, and discrimination allegations arising under 42 U.S.C.A. Section 1981. Michele has also successfully prosecuted and defended EEOC investigations, wage disputes, FMLA, Title VII, ADA, ADEA and wrongful termination cases. She has also represented employers and employees before Merit System Boards, AZ POST, fingerprint boards and other licensing boards in cases involving due process and disciplinary matters. She has also successfully defended personal injury cases, wrongful death actions, negligent hiring, training and supervision cases. Michele successfully represents governmental entities before personnel and merit system boards prosecuting disciplinary and termination matters, and in various civil rights matters, including Section 1983 matters. Outside of the firm, Michele can be found exploring the Valley’s many hiking and walking trails, and cheering on the Arizona Cardinals. Prevailed on Summary Judgment in roadway design case against Yuma County. The traffic accident occurred at an intersection that the County equipped with oversized two-way STOP signs and flashing warning signs. Plaintiffs sued Yuma County for its alleged negligence by failing to install a four way stop. Yuma County moved for summary judgment on Plaintiffs’ claims, arguing that it was statutorily immune pursuant to A.R.S. § 12-820.01 and entitled to the affirmative defense contained in A.R.S. § 12-820.03. Click here to read the full case summary. Prevailed on Summary Judgment Order in Section 1983 civil rights action for false arrest made against a City of Yuma Police Sergeant. Case involved whether probable cause existing to arrest Plaintiff, a former U.S. Border Patrol Agent, and requested return of government-issued property including firearm, badge and credentials. Click here to read the full case summary. Successfully moved for dismissal in an unlawful arrest case against an Arizona County and various County law enforcement officers. Case involved whether service of a Notice of Claim by mail was valid at the officers’ workplace. Click here to read the full case summary. Prevailed by Summary Judgment in Section 1983 civil rights action against the City of Yuma and one of its law enforcement officers, involving the use of a Taser to seize Plaintiff while feeling the scene of a physical disturbance. Plaintiff also brought claims of false arrest, malicious prosecution and assault. The Court found no liability on the part of the City or its officer. Click here to read the full case summary. Prevailed by Summary Judgment in an employment discrimination case against a local County and various County employees. Case involved the lawful and non-discriminatory termination of Plaintiff, a former road maintenance worker, for a violation of the County Merit Rules pertaining to safety sensitive positions. Click here to read the full case summary.